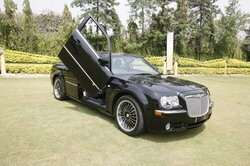 brand new chrysler, gets a upgrade with vertical door kit. There’s Luxury. Then there’s the All New Sonata, a masterpiece crafted with the ultimate in luxury and technology. Designed with the elegant and refined beauty of the orchid flower in mind, the New Sonata embraces Hyundai’s ‘Fluidic Sculpture’ philosophy where smooth, flowing lines meet function like never before. Innovation starts here! NissanConnect, India's most advanced connected car technology has intelligent features to keep you connected with your Nissan 24x7. Now Book a Service, Locate your Car, get Tow Away Alerts, Speed Alerts and 50+ features all on your smartphone with just a tap of a button.